Apologies that this post is so late, I have no idea where the pictures for this post went - scary. 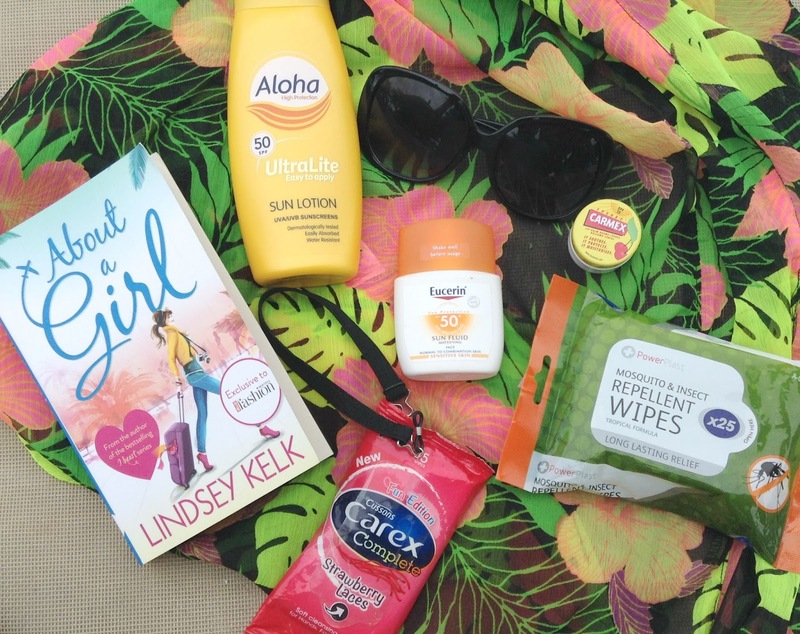 But, whilst on the beach in Mauritius I wanted to share with you my Beach/Poolside essentials, things that I just have to have with me. Reading Material // I love having a trashy magazine to read whilst soaking up the sun, but on a flight that was 16 hours the magazines were all finished. The HELLO! Fashion magazine that I picked up came with a free book from Lindsey Kelk, author of the Shopaholic series and this is her new collection of books and I whizzed through it. A great read. Sun Lotion (Body + Face) // For the body I love using the Aloha Ultralite Sun Lotion it is a non-greasy formula and sinks into the skin as soon as you apply it. Sunscreen is a hate of mine but a love as well as it protects you. And I personally prefer applying a separate one on my face like this one from Eucerin it came in the LIB box, a product that I wasn't expecting to love but do. I took it to Germany and Mauritius with me, and need to buy another one due to it nearly running out on me and summer in mind is still happening! Lip Balm // Something I picked up last minute at the airport, as my lips were extremely dry from all the travelling. I also tended to opt for only lip balm on my lips during the day and not the 100 lipsticks that I packed with me. Insect Repellent // This is a must when your in a country where little insects are flying around everywhere. These are actually wipes that I found in the Poundshop, and actually worked really well. Hand Wipes // Another necessity wherever you go in the world/near sand where everything gets really messy and these smell amazing so I couldn't resist getting them. Glasses Holder// A very fancy and boring accessory to have, but this allows me to wear my glasses and swim so I don't have to be blind. They clip on to the back like a headband and you can find them in Boots!